The Australian Competition and Consumer Commission (ACCC) has spelled out its concerns that allowing Virgin Australia to buy 60% of Tiger Australia, would create a duopoly, albeit across four brands. In a “statement of issues” released 07-Feb-2012, ACCC says: “The ACCC’s preliminary view is that the proposed acquisition may raise competition concerns in the market for Australian domestic air passenger transport services”. that the proposed acquisition would remove all competition between Virgin Australia and Tiger Australia. However, the ACCC says that the risk of Tiger Australia leaving the market if it rejects the deal will be a significant factor in its final decision due on 14-Mar-2013. The commission is concerned that allowing Virgin Australia to acquire a majority stake in Tiger Australia will reduce the domestic market from three competing groups to two airline groups, Virgin Australia/Tiger Australia versus Qantas/Jetstar. This it suggested, along with the loss of Tiger Australia as an independent LCC competitor, risked competition becoming more muted, by allowing the two groups to coordinate their activities to the detriment of consumers and potential new entrants to the market. Virgin Australia announced on 30-Oct-2012 that it would seek to acquire up to 60% of Tiger Australia as part of a trio of deals that also included a full takeover of regional operator Skywest, already approved, and the sale of a 10% stake in Virgin Australia to Singapore Airlines (SIA) Group. The transactions, if approved will be a ground shifting move for the Australian domestic market, allowing Virgin Australia to better compete with Qantas on all domestic fronts, while at the same time breathing new life into Tiger Australia which has been unprofitable since it was established in 2007. Under the deal Virgin Australia and Tiger Australia will enter into a shareholders agreement, brand licensing agreement and services agreement. Virgin Australia sees the acquisition of Tiger Australia as a means to re-enter and compete in the budget sector of the market, which it exited as Virgin Australia (previously LCC Virgin Blue) hybridised and moved up market in attempts to compete more effectively against arch-rival Qantas in the corporate sector. At the same time, the union would provide struggling Tiger Australia with a strong partner allowing it to expedite its growth as part of a dual brand strategy. 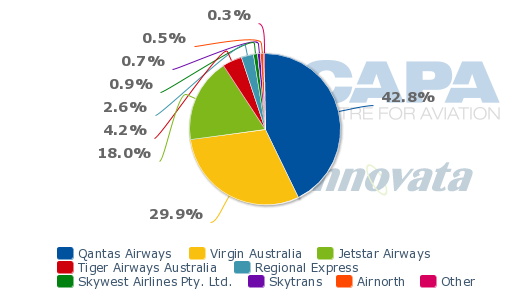 Virgin Australia currently accounts for just under 30% of domestic seat capacity in Australia. The addition of Tiger Airways Australia and Skywest will increase its combined market share to 35%, compared to about 61% for the Qantas Group. Virgin Australia says there is limited overlap between it and Tiger Australia in the customer segments they serve. Tiger Australia primarily competes with Jetstar for price sensitive leisure travellers, while Virgin Australia is focused on competing directly with Qantas for higher yielding leisure and corporate passengers. The ACCC, however, wants to investigate the competitive dynamic between the two potential partners and the extent to which leisure travellers remain an important part of Virgin Australia’s overall passenger mix, particularly outside of the peak times when cheaper prices are charged to fill aircraft. The ACCC has tentatively taken the view that Tiger Australia’s presence may act as a deterrent to tacit coordination between Virgin Australia and Qantas/Jetstar on routes that it operates on. The combined market strength of two large dual branded airline groups could also deter a new airline from entering the market in the future to compete for any excess profits, the ACCC says. It regards Tiger Australia as a significant domestic airline with a reputation for low fares, able to influence the markets it operates in. Submitters to the proposal have told the ACCC that Tiger Australia’s entry on new routes resulted in competitors responding through lower fares and increased capacity. The ACCC points to Tiger Australia’s entry on the Melbourne-Sydney route in Jul-2009 which was quickly matched by Jetstar entering the route with a five-times daily service. When Tiger Australia increased its frequencies on the route from five-times each weekday to 11-times each weekday, both Qantas and Jetstar responded by increasing their frequencies, causing fares to fall. Tiger’s influence can also be seen, at least in part, in fare levels before and immediately after its grounding in 2011. Tiger Australia claimed credit for reducing prices when it entered the market in late 2007, though, as the ACCC points out this also roughly coincided with Jetstar expanding its services, while the increase in fares in 2011 following Tiger Australia’s grounding could also be due to higher costs as well as the start of Virgin Australia’s shift to becoming a full service operation. Without the diversity offered by the dual brand approach that the Qantas-Jetstar group possesses, Virgin was in no position to compete at this lower end of the market. The ACCC considers that if it does not allow the acquisition to proceed, Tiger Australia’s Singapore parent, Tiger Holding, has the option of continuing to operate Tiger Australia, find another buyer for the airline, or shut the airline down and transfer some of its assets, such as aircraft, to its other operations in Southeast Asia. Crucially, “if the ACCC were to conclude that Tiger Australia would exit the market in the absence of the proposed acquisition, this would be highly relevant to our assessment,” the Commission says in its statement. Tiger Australia recorded a SGD13 million (USD16 million) operating loss in 3QFY2013, compared to a SGD9 million (USD11 million) loss in 3QFY2012. Passenger traffic increased 123% to 714,000 but revenues only increased 80% to SGD73 million (USD90 million). The Tiger Group was hoping for an improvement in profitability at Tiger Australia during 3QFY2013 as the carrier finally returned to pre-grounding capacity levels. But instead the carrier saw a further drop in profitability. Tiger Airways Holdings chairman J. Y. Pillay told the extraordinary general meeting called to approve Virgin Australia's bid that Tiger Australia had not been able to turn around the business after the 2011 grounding due to overcapacity in the market. "Taking stock of the situation, we have concluded that TT is just too small a player in the Australian market and it would need massive resources to reach a critical mass. Second, we need a strong partner if TT is to achieve critical mass. And third, we believe the destiny of Tiger Holdings lies in Asia, particularly the ASEAN region," Mr Pillay said. The airline had received advice that if the sale to Virgin Australia was not approved the most favourable argument was for Tiger Australia to exit the market. Tiger Australia has continued to rebuild its network since the takeover deal was announced. This includes, commencing on 15-Feb-2013, four times weekly services between Sydney and Coffs Harbour in head-to-head competition with Virgin Australia. Moreover, on 06-Feb-2013 Tiger announced it will add four new domestic routes, including a return to the Sunshine Coast and Alice Springs. The carrier will also commence Melbourne-Sunshine Coast on 27-Mar-2013, Sydney-Cairns on 04-Apr-2013, followed by four times weekly Sydney-Alice Springs and Melbourne-Alice Springs services on 09-Apr-2013. Four strong airline competitors are better than three? Or two pairs of competitors? The multi-dimensional nature of Australia's three or four airline structure (depending on how the Qantas Group pairing is counted), makes the competitive equation more difficult to assess. That perspective, combined with the flow on impact for wider competition between the Qantas and Virgin "groups", if Virgin Australia were strengthened in this way, makes for a challenging decision process for the ACCC. But perhaps the most telling point, if the approval were not granted, is that Virgin Australia would most probably be confined to a minority share where its prospects of achieving much more than 30% of the domestic market were severely limited. This would substantially limit Virgin Australia's prospects of being a long term effective competitor for Qantas – either in the leisure end of the market (where Jetstar is strongest) or in the corporate market, where the premium Qantas brand dominates. The creation of two airline groups, competing with four brands, is arguably likely to provide greater competitive symmetry than one large group in the form of Qantas/Jetstar against two smaller competitors. In pragmatic terms that would seem like a sensible market adjustment, against the background of a faltering domestic economy with softening demand. The ACCC will receive further submissions in response to its preliminary views by 22-Feb-2013.